These highlights do not include all the information needed to use FEIBA safely and effectively. See full prescribing information for FEIBA. Thromboembolic events have been reported during post-marketing surveillance, particularly following the administration of high doses and/or in patients with thrombotic risk factors. Monitor patients receiving FEIBA for signs and symptoms of thromboembolic events (5.1, 6.2). Until pain and acute disabilities are improved. At least 1 day or until bleeding is resolved. Until resolution of bleed and healing is achieved. Dosage and duration of treatment depend on the location and extent of bleeding, and the patient's clinical condition. Careful monitoring of replacement therapy is necessary in cases of major surgery or life-threatening bleeding episodes. Allow the vial of FEIBA and Sterile Water for Injection (diluent) to reach room temperature. Remove the plastic caps from the concentrate and diluent vials. Wipe the rubber stoppers of both vials with a sterile alcohol swab and allow it to dry prior to use. Open the package of BAXJECT II Hi-Flow device by peeling away the lid completely without touching the inside (Fig. A). Do not remove the device from the package. Do not touch the clear spike. Place the diluent vial on a flat and solid surface. 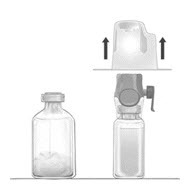 Turn the package over and insert the clear plastic spike through the diluent stopper by pressing straight down (Fig. B). Grip the BAXJECT II Hi-Flow device package at the edges and pull the package off the device (Fig. C). Do not remove the blue protective cap from the BAXJECT II Hi-Flow device. Do not touch the purple spike. Turn the system over, so that the diluent vial is on top. Quickly insert the purple spike of the BAXJECT II Hi-Flow device fully into the FEIBA vial. The vacuum will draw the diluent into the FEIBA vial (Fig. D). The connection of the two vials should be done expeditiously to close the open fluid pathway created by the first insertion of the spike to the diluent vial. Gently swirl (do not shake) the vial until FEIBA is completely dissolved. Make sure that FEIBA has been dissolved completely; otherwise, active material will not pass through the device filter. The reconstituted solution should be inspected visually for particulate matter before administration. The solution should be discarded if it is not clear or is discolored. Administer FEIBA within 3 hours after reconstitution. Do not refrigerate after reconstitution. Discard unused portion. Accidental needle stick with a needle contaminated with blood can transmit infectious viruses including HIV (AIDS) and hepatitis. Obtain immediate medical attention if injury occurs. Place needles in a sharps container after single- dose use. Remove the blue protective cap from the BAXJECT II Hi-Flow device. 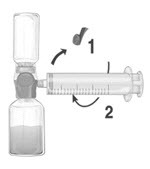 Tightly connect the syringe to the BAXJECT II Hi-Flow device (DO NOT DRAW AIR INTO THE SYRINGE) by turning the syringe in clockwise direction until stop position. Use of a Luer lock syringe is highly recommended to ensure a tight connection between the syringe and the BAXJECT II Hi-Flow device (Fig. E). Invert the system so that the dissolved FEIBA product is on top. Draw the dissolved product carefully into the syringe by pulling the plunger back slowly to avoid foaming (Fig. F). Ensure that the tight connection between the BAXJECT II Hi-Flow device and the syringe is maintained. Attach a suitable needle and inject or infuse intravenously at a rate that does not exceed 2 units per kg of body weight per minute. A syringe pump may be used to control the rate of administration. For a patient with a body weight of 75 kg, this corresponds to an infusion rate of 2.5 - 7.5 mL per minute depending on the number of units per vial (see actual potency presented on the vial label). 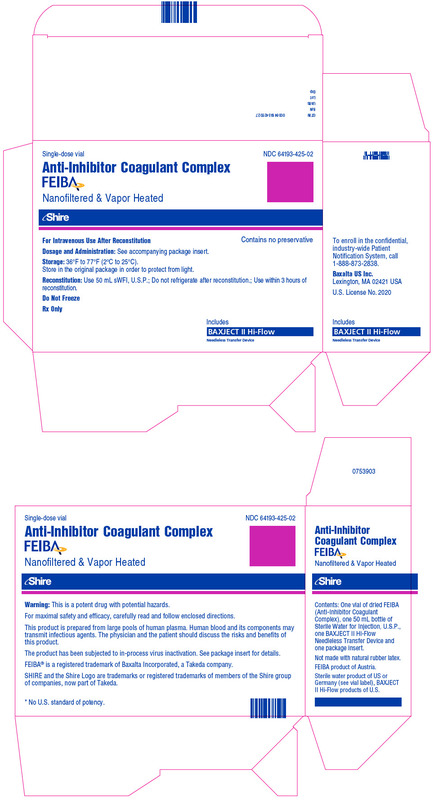 FEIBA is available as a lyophilized powder in single-dose glass vials containing nominally 500, 1000, or 2500 units per vial. Thromboembolic events (including venous thrombosis, pulmonary embolism, myocardial infarction, and stroke) can occur with FEIBA, particularly following the administration of high doses (above 200 units per kg per day) and/or in patients with thrombotic risk factors [see Adverse Reactions (6)]. The safety and efficacy of FEIBA for breakthrough bleeding in patients receiving emicizumab has not been established. Cases of thrombotic microangiopathy (TMA) were reported in a clinical trial where subjects received FEIBA as part of a treatment regimen for breakthrough bleeding following treatment with emicizumab.6 Consider the benefits and risks with FEIBA if considered required for patients receiving emicizumab prophylaxis. If treatment with FEIBA is required for patients receiving emicizumab, the hemophilia treating physician should closely monitor for signs and symptoms of TMA. In FEIBA clinical studies thrombotic microangiopathy (TMA) has not been reported. Because FEIBA is made from human plasma it may carry a risk of transmitting infectious agents, e.g., viruses, and the variant Creutzfeldt-Jakob disease (vCJD) agent, and theoretically, the Creutzfeldt-Jakob disease (CJD) agent. The risk has been minimized by screening plasma donors for prior exposure to certain viruses, by testing for the presence of certain current virus infections and by inactivating and removing certain viruses during the manufacturing process [see Description (11)]. Despite these measures, the product may still potentially transmit human pathogenic agents. There is also the possibility that unknown infectious agents may still be present. All infections thought by a physician to have been possibly transmitted by this product should be reported by the physician or other healthcare providers to Baxalta US Inc., at 1-800-423-2090 (in the U.S.) and /or to FDA Med Watch (1-800-FDA-1088 or www.fda.gov/medwatch). The most frequently reported adverse reactions observed in >5% of subjects in the prophylaxis trial were anemia, diarrhea, hemarthrosis, hepatitis B surface antibody positive, nausea, and vomiting. Table 2 lists the adverse reactions in >5% of subject reported in the randomized, prospective prophylaxis trial comparing FEIBA prophylaxis with on-demand treatment in 36 hemophilia A and B subjects with inhibitors to factors VIII or IX3. The trial population included 33 (92%) subjects with hemophilia A and 3 (8.3%) subjects with hemophilia B. Four (11%) subjects were ≥7 to <12 years of age, 5 (14%) were ≥12 to <16 years of age, and 27 (75%) were ≥16 years of age. A total of 29 (80.6%) subjects were Caucasian, 3 (8.3%) Asian, 2 (5.6%) Black/African American, and 2 (5.6%) other. The subjects received a total of 4,513 infusions (3,131 for prophylaxis and 1,382 for on-demand). The following adverse reactions have been identified during post-approval use of FEIBA. Because post-marketing reporting of adverse reactions is voluntarily and from a population of uncertain size, it is not always possible to reliably estimate the frequency of these reactions or establish a causal relationship to product exposure. Consider the possibility of thrombotic events when systemic antifibrinolytics such as tranexamic acid and aminocaproic acid are used during treatment with FEIBA. No adequate and well-controlled studies of the combined or sequential use of FEIBA and recombinant factor VIIa antifibrinolytics, or emicizumab have been conducted. 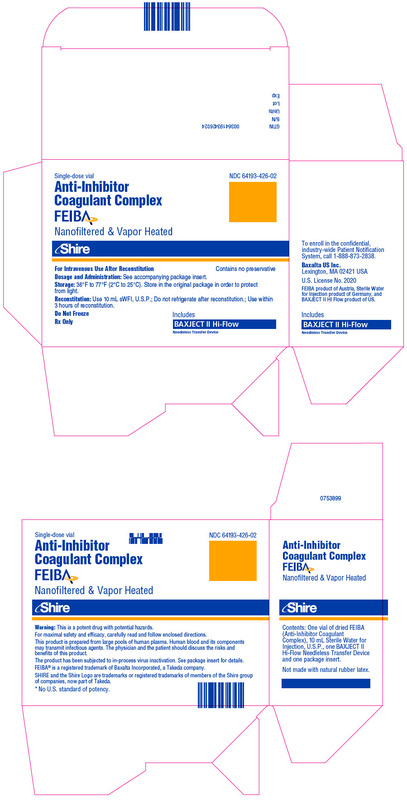 Use of antifibrinolytics within approximately 6 to 12 hours after the administration of FEIBA is not recommended. There are no data with FEIBA use in pregnant women to inform a drug-associated risk. There are no adequate and well-controlled studies in pregnant women. Animal reproduction studies have not been conducted with FEIBA. It is also not known whether FEIBA can cause fetal harm when administered to a pregnant woman or can affect reproductive capacity. FEIBA should be administered to pregnant women only if clearly needed. In the U.S. general population, the estimated background risk for major birth defects and miscarriage in clinically recognized pregnancies is 2-4% and 15-20%, respectively. There is no information regarding the presence of FEIBA in human milk, the effect on the breastfed child, or the effects on milk production. Because many drugs are excreted in human milk, caution should be exercised when FEIBA is administered to a nursing woman. The development and health benefits of breastfeeding should be considered along with the mother's clinical need for FEIBA and any potential adverse effects on the breastfed child from FEIBA or from the underlying condition. Reduction factor for Parvovirus B19 claimed for the Vapor Heat Treatment is based on results derived from experimental infectivity and titration assays. Reduction factors < 1 log are not used for calculation of the overall reduction factor. The first trial was a multicenter, randomized, double-blind trial comparing the effect of FEIBA and a non-activated prothrombin complex concentrate in 15 subjects with hemophilia A and inhibitors to factor VIII. The inclusion criteria were history of high titer inhibitors, high responder status, more than 1 bleeding episode per month in the prior year and no signs of liver failure. A total of 150 bleeding episodes including 117 joint, 20 musculoskeletal and 4 mucocutaneous bleeds, were treated. A single dose of 88 units per kg of body weight was used uniformly for treatments with FEIBA. A second treatment was allowed for muscle bleeds after 12 hours and 6 hours after mucocutaneous bleeds, if necessary. The second trial with FEIBA was a multicenter randomized, prospective trial. This trial was conducted in 44 hemophilia A subjects with inhibitors, 3 hemophilia B subjects with inhibitors and 2 acquired factor VIII inhibitor subjects. It was designed to evaluate the efficacy of FEIBA in the treatment of joint, mucous membrane, musculocutaneous and emergency bleeding episodes such as central nervous system hemorrhages and surgical bleedings. The inclusion criteria used were age >4 years, history of inhibitor titer ≥4 BU and without chronic liver disease. Subjects were excluded if they had a history of thromboembolic events or allergic reactions to FEIBA. In a multicenter, open-label, prospective, randomized clinical trial comparing subjects receiving FEIBA for prophylaxis with subjects receiving FEIBA for on-demand treatment, 36 hemophilia A and B subjects with inhibitors to factor VIII or IX were analyzed in the intent-to-treat analysis. Study population included 29 (80.6%) Caucasian, 3 (8.3%) Asian, 2 (5.6%) Black/African American, and 2 (5.6%) other. Inclusion criteria were subjects with a history of high titer inhibitors or low titer refractory to increased factor VIII or IX dosing, age range between 4 and 65, and subjects receiving bypassing agents with ≥12 bleeds in the 12 months prior to trial entry. Subjects with a history of thromboembolic events, symptomatic liver disease, or a platelet count <100,000 per mL, and those receiving immune tolerance induction or routine prophylaxis were excluded. Subjects were randomized to receive 12 months of prophylactic or on-demand treatment with FEIBA. Seventeen subjects randomized to the prophylaxis arm received 85 units per kg of FEIBA every other day. Nineteen subjects randomized to the on-demand arm received FEIBA for the treatment of acute bleeding episodes per the dose and dosing regimen recommended. Target joints were defined as ≥4 bleeding episodes within 6 months. In this trial, ankles, knees, elbows and hips were target joint locations. Preexisting target joints were not considered as new target joints. Hemostatic efficacy for treatment of acute bleeds was evaluated at 6 and 24 hours according to a pre-specified four-point scale of excellent, good, fair, or none. An evaluation of "none" was considered a treatment failure. The criteria for evaluation of the effectiveness were relief of pain, cessation of bleeding, and number of infusions required to treat a bleed. A total of 825 bleeding episodes were reported including 196 that occurred during prophylaxis and 629 that occurred during on-demand therapy. A majority (78%) of the 794 bleeding episodes that were rated for efficacy were treated with 1 or 2 infusions. Hemostatic efficacy was rated as excellent or good for 74% of bleeding episodes rated at 6 hours post infusion and for 87% of the bleeding episodes at 24 hour post infusion. A total of 19 (2.4%) bleeds were rated as "none" at 6 hours post infusion; 1 bleed (0.1%) was rated "none" at 24 hours. Hemostatic efficacy for routine prophylaxis was evaluated against subjects who received on-demand therapy. The overall median annual bleed rate (ABR) for the on-demand arm was 28.7 compared to 7.9 for the prophylaxis arm, which represents a 72% reduction in median ABR with prophylaxis. When analyzed by site (e.g. joint, non-joint) and cause of bleed (e.g. spontaneous, traumatic), prophylactic treatment with FEIBA resulted in a greater than 50% reduction in ABR. There were fewer subjects in the prophylaxis arm who developed new target joints (7 new target joints in 5 subjects treated with prophylaxis compared to 23 new target joints in 11 subjects in the on-demand arm). Target joints developed in two subjects in the on-demand arm and three in the prophylaxis arm who did not have reported target joints at trial enrollment. A total of 3 of 17(18%) subjects had no bleeding episodes on prophylaxis. In the on-demand arm, all subjects experienced a bleeding episode. ABR by age category between on-demand and prophylaxis regimens is provided in Table 4. One adolescent subject on prophylaxis had a higher rate of bleeding possibly due to increased physical activity after study enrollment. Sjamsoedin LJ, Heijnen L, Mauser-Bunschoten EP, van Geijlswijk JL, van Houwelingen H, van Asten P, Sixma JJ. The effect of Activated Prothrombin-Complex Concentrate (FEIBA) on joint and muscle bleeding in patients with Hemophilia A and antibodies to Factor VIII. N Engl J Med. 1981;305(13): 717-721. Hilgartner MW, Knatterud GL. The use of Factor-Eight-Inhibitor-By-Passing-Activity (FEIBA IMMUNO) product for treatment of bleeding episodes in Hemophiliacs with inhibitors. Blood. 1983;61(1): 36-40. Antunes SV, Tangada S, Stasyshyn O, Mamonov V, Phillips J, Guzman-Becerra N, Grigorian A, Ewenstein B, Wong WY. Randomized comparison of prophylaxis and on-demand regimens with FEIBA NF in the treatment of haemophilia A and B with inhibitors. Haemophilia. 2013; DOI 10.1111/hae.12246. Turecek PL, Varadi K, Gritsch H, Auer W, Pichler L, Eder G, Schwarz HP. Factor Xa and prothrombin: mechanism of action of FEIBA. Vox Sanguinis 1999;77 Suppl 1:72-79. Oldenburg et al. Emicizumab Prophylaxis in Hemophilia A with Inhibitors. N Engl J Med 2017:377:809-818. FEIBA is packaged with a suitable volume (10 mL, 20 mL or 50 mL) of Sterile Water for Injection, U.S.P., one BAXJECT II Hi-Flow Needleless Transfer Device, and one Package Insert. of the signs and symptoms of thrombosis, such as chest pain or pressure, shortness of breath, altered consciousness, vision, or speech, limb or abdomen swelling and/or pain. Advise patients to seek immediate medical attention if any of these symptoms occur. of the signs and symptoms of hypersensitivity reactions, such as urticaria, angioedema, gastrointestinal manifestations, bronchospasm, and hypotension. Advise patients to discontinue use of the product if these symptoms occur and seek immediate emergency treatment. that because FEIBA is made from human blood, it may carry a risk of transmitting infectious agents, e.g., viruses, the variant Creutzfeldt-Jakob disease (vCJD) agent, and theoretically, the Creutzfeldt-Jakob disease (CJD) agent. to report any adverse reactions or problems following FEIBA administration to their hemophilia treating physician. BAXALTA® and FEIBA® are trademarks of Baxalta Incorporated, a wholly-owned, indirect subsidiary of Shire plc. Dosage and Administration: See accompanying package insert. Use within 3 hours of reconstitution. Dosage & Administration: See accompanying package insert. Storage: Room temperature not to exceed 25°C (77°F). exceed 25°C (77°F); Use within 3 hours of reconstitution. isotonic by addition of suitable solute. Discard unused portion. Do not use unless clear. No antimicrobial agent or other substance has been added. addition of suitable solute. Discard unused portion. order to protect from light. (77°F); Use within 3 hours of reconstitution. to exceed 25°C (77°F); Use within 3 hours of reconstitution.